The lifelong learning mindset is more than just about the need to learn; it’s about a desire to learn that lasts a lifetime. So, what does it mean for students to adopt such a habit and how can we help them do it? All our lives, we never truly stop learning. What makes our learning experiences enjoyable or unpleasant is how we’ve been conditioned to react to them. If we were taught as children that mistakes and failure are synonymous with not being good enough, this is what we believe. Now, imagine the opposite. Consider the effects of equating mistakes with opportunities for strengthening understanding and awareness. Think of a baby taking those first steps before falling – we don’t admonish the child for not taking one step more than we expected, do we? Instead, we celebrate the achievement with joy and love. We clap and express gratitude that we were fortunate enough to bear witness. The child becomes happy, encouraged, and determined to do even better. That’s why we must ensure learning is presented as a rewarding journey from early on – students are then much more likely to continue wanting to learn as they grow older. We ask ourselves, as parents and educators, how can we foster the lifelong learning mindset. Consider the following suggestions as starting points for your child. Kids fear failure because they are often conditioned to believe it comes with a punishment. To counteract this, assure them you will do everything in your power to help. If they do fail (and they will from time to time), make it a useful experience. Recognise what went right and focus proactively on where to improve. In this way, the student learns not to fear mistakes, since making them is an integral part of any learning process. Students often wonder why they are learning what we teach them. This doesn’t need to be explained so much as demonstrated. 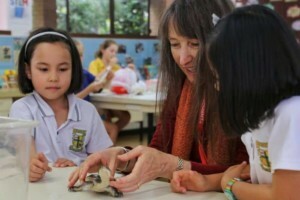 It occurs naturally through inquiry- and project-based learning challenges – real-world connections that make practical sense. It’s also a good idea to step out of the classroom whenever you can. Exposing kids to learning scenarios that are tangible, relevant and hands-on will ignite that willingness to learn that every teacher and parent loves to see. Teachers are no longer required to be the gatekeepers of all knowledge. As such, their role has gradually become one of a facilitator. We now guide and encourage critical thinking and independent discovery, which are both core components of a lifelong learning mindset. Teachers and parents can help kids to discover and be comfortable with how they learn best. When kids who play sports perform poorly in a game, they know what they need to work on and they don’t waste time with things they can already do well. Their learning is their own, and they do it willingly. Mind/body health leads to a willingness and desire to learn. When the whole student is healthy, they feel good; this promotes positive learning and discovery. Encourage learners to educate themselves about nutrition and exercise as part of their personal responsibility. It’s well known that students connect with learning that is relevant to their interests. No relevance equals no connection, and therefore no learning. Part of cultivating the lifelong learning mindset means constantly linking to concepts that will make kids stand up and take notice. Start by asking about those interests and getting a sense of why they’re important. What makes them curious? What inspires them? Good questioning habits are at the heart of discovery and gaining new knowledge. A great practice with students is to ask them what they think. This achieves a few things. First, it shifts the responsibility for learning to the student. Second, it places value on the student’s opinions and insights. Third, it challenges them to think independently and critically. Finally, it guides them not to rely on their teacher for the answer to everything. Say it loud and proud: the journey of 1,000 miles begins with a single step. Lao Tzu was definitely talking about the journey of life – how this nurtures the lifelong learning mindset will keep us guessing and growing for as long as we live. As it should. The day we stop learning is the day we stop being curious. Life will continue to present us with choices and most important is what we choose to learn from them. Our students are on a journey of learning in school that continues well beyond the classroom. A healthy and positive lifelong learning mindset is the greatest gift we can give students to continue their journey with. So here’s to lifelong learning. Written by Lee Watanabe Crockett.